The other shuttle Phase-B design team -- McDonnell-Douglas and Martin Marietta -- presented its final design on June 30, 1971. The Martin Marietta booster was derived from an alternative “Spacemaster” booster concept. All landing jet engines were installed inside the forward canard wing to improve the center of gravity, to compensate for the huge mass of the ascent propulsion system which consisted of thirteen Space Shuttle Main Engines. 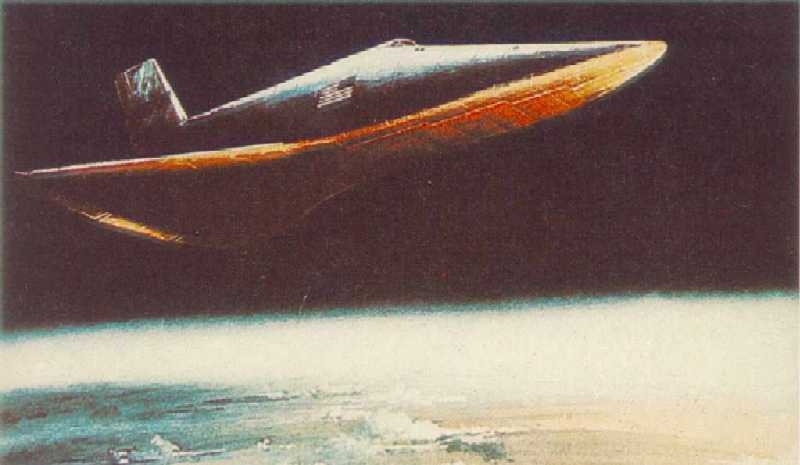 The high-mounted aft wing with wing tips was chosen to provide the least interference with the orbiter at launch while still producing adequate stability for the booster. 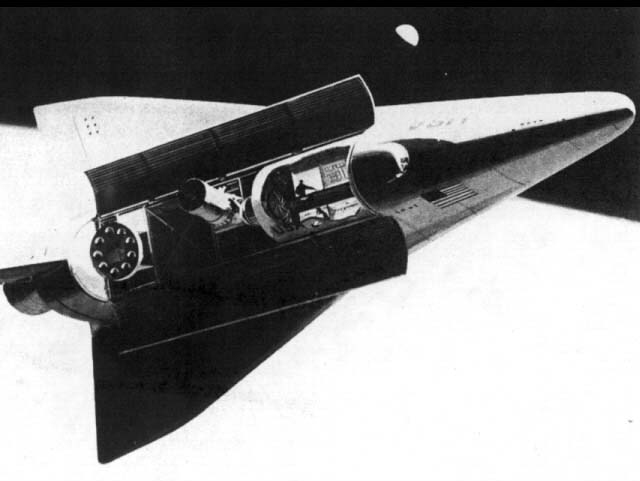 The Martin Marietta booster was expected to provide a higher degree of directional stability, except during the subsonic part of the flight and during landing, when the General Dynamics low-wing design would be less sensitive to crosswinds. Unlike North American Rockwell, McDAC settled for a metallic thermal protection system on the shuttle orbiter. Titanium, nickel and columbium materials would have been used. In most other respects, the McDAC and NAR Phase B orbiters were quite similar. Both featured a large delta wing plus single vertical stabilizer fin, an 18.3 * 4.57-meter cargo bay, two Space Shuttle Main Engines for propulsion and RL-10s for maneuvering in space. 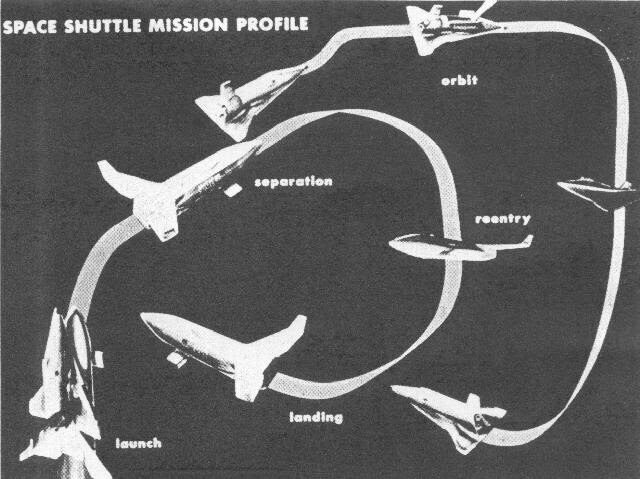 McDonnell-Douglas/Martin Marietta shuttle flight plan. The staging maneuver was at 63.8km altitude. The booster's engines would have to burn 1,378.3t of LOX/LH2 propellants to accelerate the vehicle to a velocity of 3300m/s. The orbiter's twin engines would have used another 241,648kg of propellants to reach orbit. McDonnell-Douglas shuttle orbiter with sortie module. NASA also planned a series of pressurized and unpressurized experiment modules for the space station and space shuttle. They would be used for carrying space station logistics, as free-flying experiment carriers and other purposes. As the space station was postponed, the experiment module gradually evolved into a “sortie lab” for the shuttle, essentially transforming it into a mini-space station for flights lasting up to 30 days. General Dynamics received a contract to study space station experiment modules in August 1969 which eventually morphed into a shuttle “Research and Applications Module” (RAM). The General Dynamics RAM contract was extended in April 1971 but NASA was unable to afford the $1-billion cost in the end. The “Spacelab” project was finally farmed out to the European Space Research Organization in June 1972. McDonnell-Douglas shuttle orbiter & Modular Space Station (MSS). Another shuttle payload was NASA's space station. 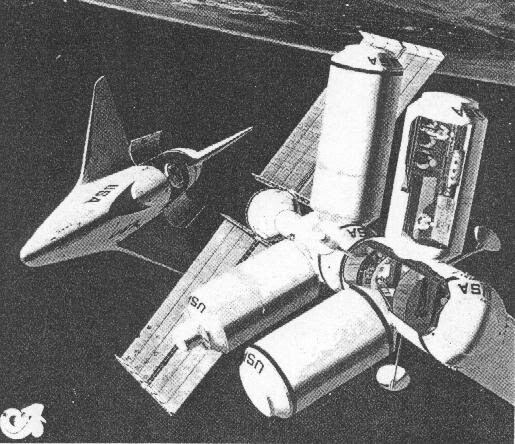 NASA awarded a series of Phase-B station extension contracts to McDAC and North American Rockwell in March 1971, to study modular space station configurations that could be launched by the shuttle. The initial goal was now a 6-man space station that would have required nine shuttle assembly flights. NASA's Phase B Shuttle flight plan called for 445 missions over ten years. Only 15.73% of the flights would involve manned space station assembly & logistics, 42.25% would be dedicated to deployment of NASA satellites and space probes and another 34.61% would be reserved for the military. The remaining 7.41% would be dedicated to OTVs, i.e. “space tugs” transporting cargo to higher orbits. This mission model was strikingly different from the mid-1969 shuttle Phase Aplan which assumed the launch manifest would be only 5% unmanned payloads and 95% manned space station/space base/moonbase support! (NOTE -- all figures in 1970 $ millions) DDT&E PROD. OPS. TOTAL TOTAL (1999 $M). 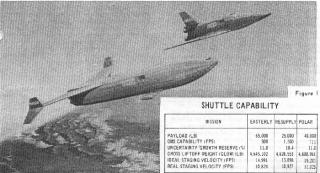 According to McDonnell-Douglas' cost estimate from June 1971, the Phase-B shuttle would have cost about $12.815 billion [1970 rates] over 445 flights in 1972-88. The equivalent life-cycle cost in 1999 dollars would be about $55 billion. But many observers questioned the accuracy of those estimates since several key technologies (high-pressure reusable engines, thermal protection system etc.) were unproven. Payload capability (without landing jets): 29,484kg into a 185km 28.5 deg. Orbit; 18,144kg into a 185km 90 deg. polar orbit; 11,340kg into a 500km 55 deg. orbit with landing jets installed on orbiter & 20,411kg without engines. Cost per mission: $4.5 million. [1970 rates] or $660/kg+ in 1999. 75 missions/year max. Space station rescue mission capability within 48 hours of emergency call. Liftoff Thrust: 2,606,810 kgf. Total Mass: 2,106,982 kg. Core Diameter: 11.5 m. Total Length: 85.7 m.